ATmega 324 Development Stick is a very compact development stick equipped with USB port for direct connectivity with latest laptops and PCs. It is also USB powered and does not need additional power supply when connected to PC or Laptop. Board comes with pre-installedbootloader and can be programmed directly from PC via USB connection with AVRdudesoftware. All the IO ports are available on berg connectors for extended connectivity and use.It also has LCD connections at Port-B with contrast adjustment potentiometer and back-lighton-off control. 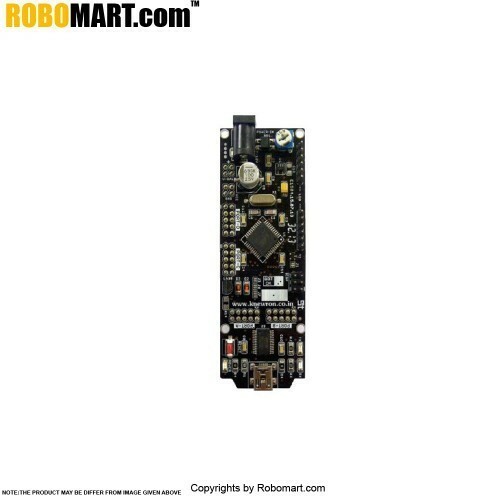 This board is designed to correctly align with 16x2 LCD (LCD size 80mm x36mm). USB enabled (onboard serial to USB converter). No need for separate power supply (when used. Pre-installed bootloader, works with AVRdude. 32 I/Os (inclusive of 8 Analog I/Os). Two serial ports (one connected to USB). Equipped with on-board temperature sensor (LM35). Can sense negative temperature too. Default powered with USB supply and supports. 6 pin ISP terminal available for programming the. board with external programmer, if needed. Compact size : 100mm x 36mm. Double sided, steardy yet compact and light-weight. Provision for external power supply with reverse. Inbuilt 5V voltage regulator for stable system supply. 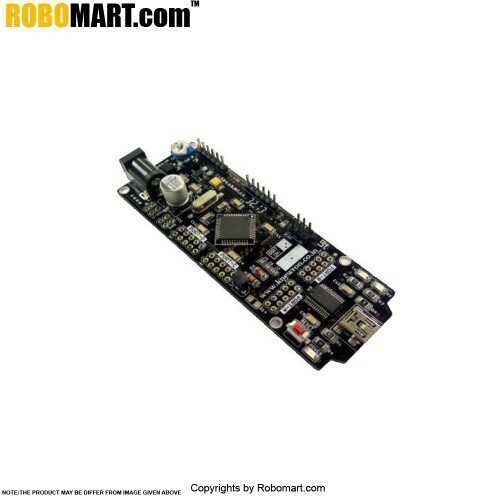 Assembled & tested development board - 1 Nos.